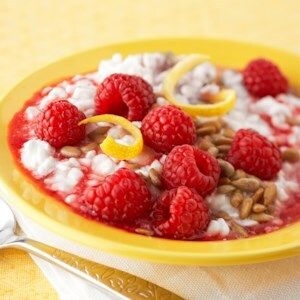 Find healthy, delicious raspberry recipes, from the food and nutrition experts at EatingWell. Balsamic vinegar adds a tart-sweet accent to the grape and raspberry fruit filling in this beautiful pastry-topped dessert. 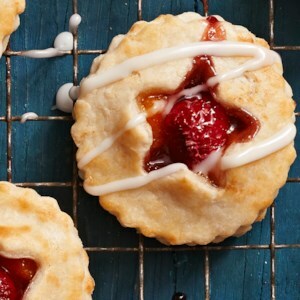 What's more fun than beautifully decorated individual dessert pies? These fruity hand-held treats are full of raspberry jam, peach pie filling, and fresh raspberries. 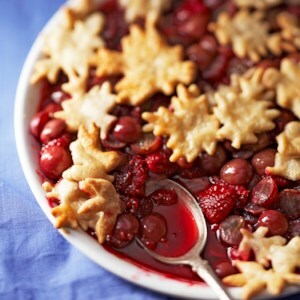 Be creative and substitute any of your favorite pie fillings, preserves, and fresh berries--your guests will thank you! Owning an ice cream maker means you can create specialty ice cream flavors at home, for a fraction of what you'd pay at your local ice cream shop. 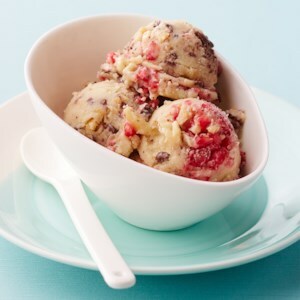 This almond ice cream is a real treat, bursting with chunks of raspberries, slivered almonds, and dark chocolate pieces. 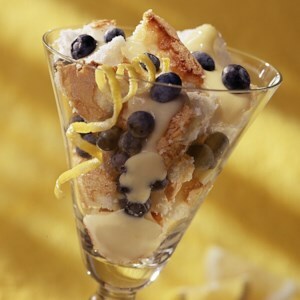 These summer-fresh parfaits are full of vanilla pudding and cubes of airy angel food cake. 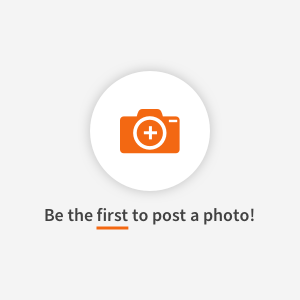 Fresh berries and lemon peel add a fruity zing to each bite, but feel free to substitute sliced strawberries, coarsely chopped nectarines, or ripe, juicy peaches. Cooks tend to bring their most diet-undoing desserts to the potluck table. Why not offer these creamy bars and treat diners to something more healthful they can enjoy? Overnight French toast recipes are easy to prepare and a great choice when you have houseguests who'll want a hearty and special breakfast in the morning. 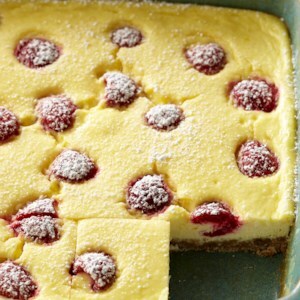 This recipe is extra-special because the French toast is stuffed with a cream cheese and raspberry filling which becomes an ooey-gooey treat in each bite. 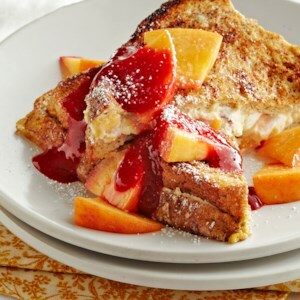 Topped with a raspberry sauce, fresh peaches, and powdered sugar, this breakfast recipe will be a hit with everyone at your table. Who doesn't love a homemade ice cream cake? This dessert recipe is simple to make and so beautiful your guests won't believe you made it yourself. 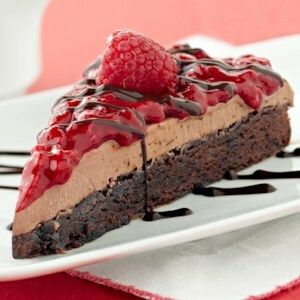 A chocolate brownie crust layered with mocha ice cream and topped with raspberry sauce, fresh raspberries, and chocolate syrup--it's so thick we recommend serving it with a long cake knife, a chef's knife, or a bread knife. This quick egg scramble with hearty bread is one of the best breakfasts for weight loss. 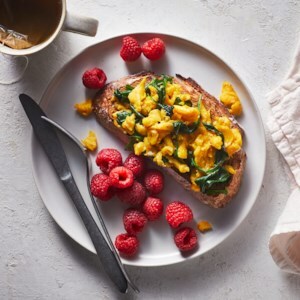 It combines weight-loss power foods, eggs and raspberries, with filling whole-grain toast and nutrient-packed spinach. The protein and fiber help fill you up and the whole meal clocks in at just under 300 calories. Thin slices of grilled pork tenderloin are combined with baby spinach and drizzled with a fruity dressing, fresh berries, and homemade pickled red onions in this satisfying pork salad recipe. Canned mandarin oranges and fresh raspberries add brilliant pops of color and fruity taste to this easy 20-minute salad recipe. 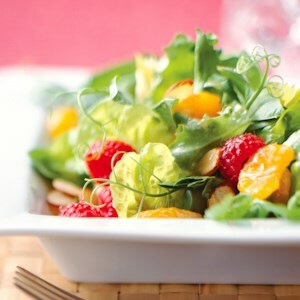 The fruit is combined with mixed greens and an orange-mustard dressing and topped with crunchy sliced almonds. 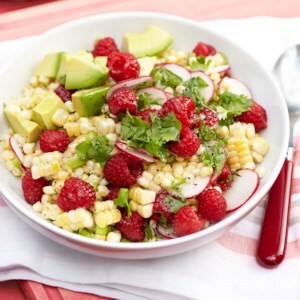 Crunchy corn, creamy avocados, zesty radishes and fresh raspberries--this colorful salad is like art on a plate! And you'll love the zesty lime dressing that ties it all together. 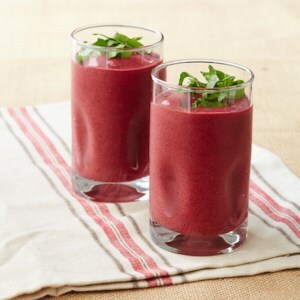 Fresh and frozen berries abound in this quick and delicious smoothie. Baby spinach adds fiber and vitamins and the protein powder of your choice will leave you feeling satisfied through your next meal! 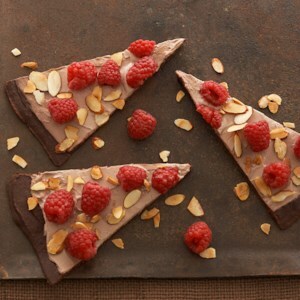 A chocolate brownie crust is spread with light chocolate filling and topped with raspberries for a pretty, flavorful dessert. 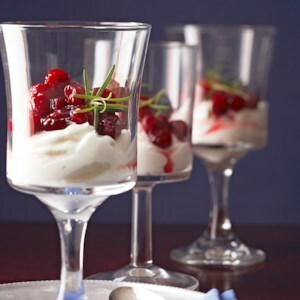 A warm cherry, raspberry and cranberry compote--with a savory hint of rosemary-- makes a tasty topper for the tangy, thick yogurt in this sophisticated, low-fat dessert. 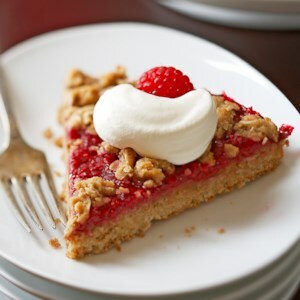 Whole-wheat flour and oats add a nutty flavor to the dense, slightly-sweet crust of these dessert treats, which pairs well with the luscious raspberry filling. 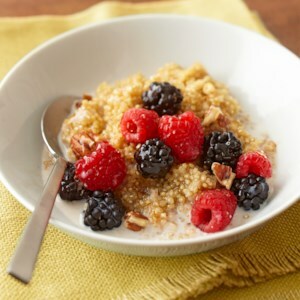 This sweet quinoa dessert is topped with fresh blackberries and raspberries and drizzled with honey. 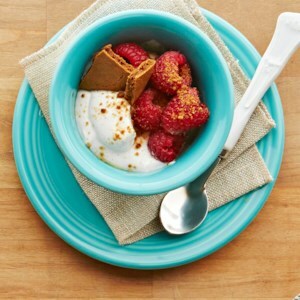 Top Greek yogurt with fresh raspberries and a crushed gingersnap cookie and you've got an easy dessert-for-one, ready in just 5 minutes. 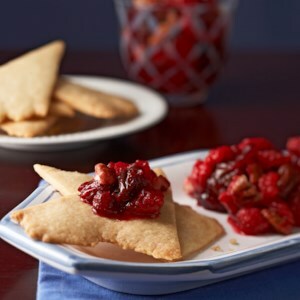 Crispy shortbread triangles are capped with a four-fruit chutney in this dessert recipe. 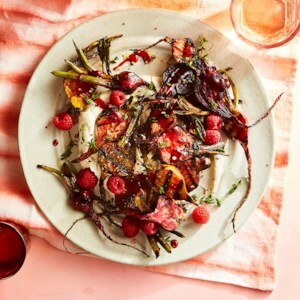 Crunchy sunflower seeds add delicious flavor to this simple, light meal or snack of cottage cheese dressed up with raspberries and honey.